Lovely evening, but just chilly enough to be wearing a light jumper (a green one in my case, although I notice from the photos that everyone else seems to have a coat on – must be summer then). So, having gathered on Paradise Road, we walked halfway down the steps to the beach and I talked about how some plants grew on the side with that was nutrient-rich and some on the side that was nutrient-poor albeit growing much shorter and that there were different species of plants on each side. We noticed (after I’d pointed it out) that a few different species were present only in one spot down the side of the cliff – Meadowsweet, Great Willowherb and Hard Rush where I said it would be wetter than elsewhere in order for those plants to grow well. We talked (okay, I talked and everyone else politely listened and nodded in the right places because #polite) about how plants have a Goldilocks spot where the conditions are just right for them to grow and flower (and there isn’t any other plant there which can grow better than them and so shade them out). Also, while we were there, we looked at the surprisingly attractive seaside form of curled dock and I then explained how it differed from the inland form (You can imagine how everyone felt when they found that out….well you can if try really hard). 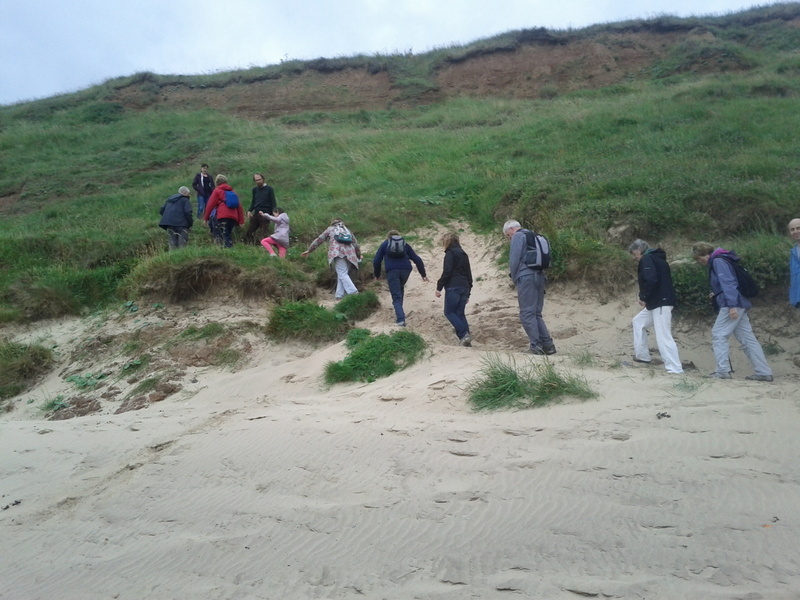 And so down the steps and across the path to look at the cliff face opposite. 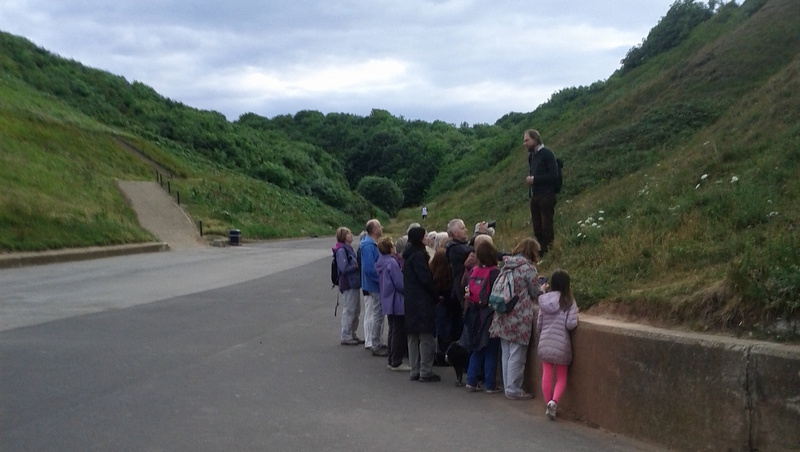 I did my impression of the sermon on the mount I notice, although at the time I was too busy pointing out the locally rare Small Scabious which is found scattered on this cliff-side and also other more familiar sea-side plants which were looking particularly flowery like Common Restharrow, Sea Plantain and Wild Carrot. A quick march along the beach and then up the cliff (if you walk up in a zigzag it’s not so very steep) to see the absolutely stunningly-beautiful white flowers (only two open) of Grass-of-Parnassus growing in a nutrient-poor wet flush on the cliffside near the top. On the way were the likes of Marsh Fragrant-orchid, Pyramidal Orchid and the last of the Common Spotted-orchid flowers, along with a large patch of Zigzag Clover and much Rough Hawkbit (though with flowers closed as it was evening) on the way down. 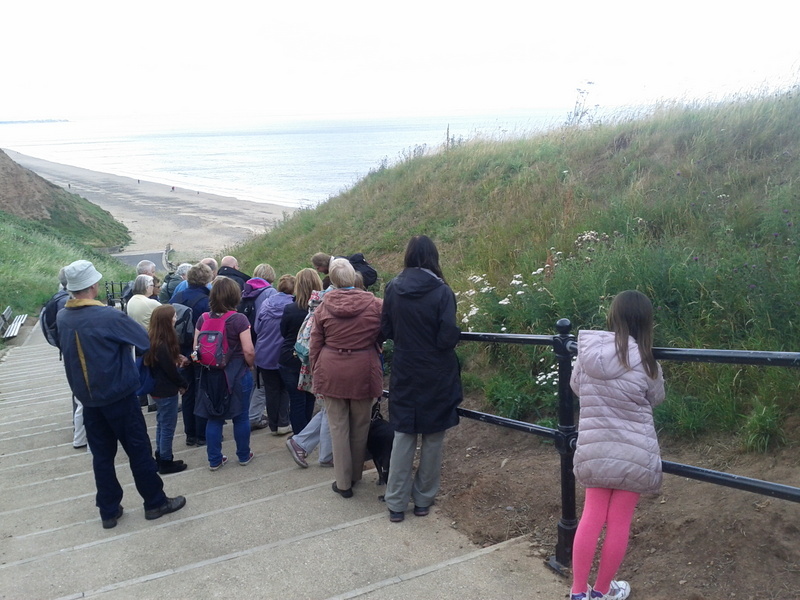 Back towards Saltburn, and where the stream from Hazel Grove runs onto the beach we stopped to look at Frosted Orache, Spear-leaved Orache, Sea Rocket and Sea Sandwort before walking back up the steps which I noticed were steeper going up than coming down…how does that happen?